A spacious and attractive compound with enough room to house up to 48 bikes. Comes with a fitted curved canopy for an additional layer of security - but is available without a roof (see related products). The roof panels are made from UV resistant opaque polycarbonate. 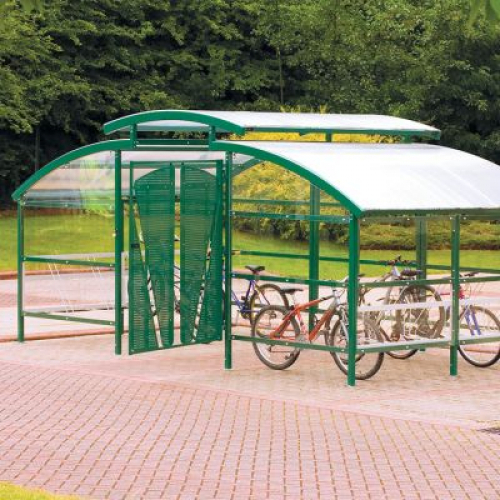 This shelter is perfect for large workplaces, colleges, Universities or any other high traffic location. Comes in 3 sizes, with enough room for 16, 32 or 48 bikes. Compound is gated with hasp to take padlock (padlock not included). Installation is available - please get in contact. Side panels made from perspex. Metal parts powder coated to improve weather resistance. Must be bolted to 250mm thick concrete (fixings included).